No one intended for CodePen to be a business. Alex Vazquez, Tim Sabat, and Chris Coyier met up one day to start making a website — or as Alex puts it, to “do what nerds do when they get together.” He thought the project would last maybe a week, maybe a month. The three friends were the first developers and designers hired at Wufoo, an HTML form builder that was sold to SurveyMonkey in 2011. Chris Coyier, the man behind CSS-Tricks, wanted to create a user-friendly way for frontend developers to show off their code. 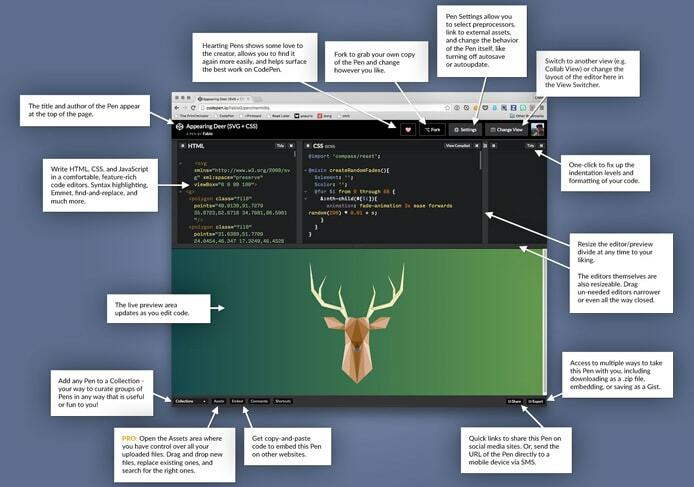 CodePen’s live coding environment features an in-browser code editor in which users create projects, called Pens. From there, developers can collaborate, critique, and find inspiration from other members. The Co-Founders originally offered CodePen tools for free but have slowly evolved to the current freemium model. Pro features include cross-browser testing, asset hosting, and increased collaborative capabilities. According to Alex, the CodePen team keeps a strong balance between paid and free features. Alex fondly calls CodePen’s quest to meet every user’s needs an “odd blessing and a curse.” He occasionally feels jealous about a friend whose livelihood is concentrating on how an online article scrolls up and down on Medium. Versatility, however, is CodePen’s signature accomplishment. “We’ve always looked at how people are using CodePen and how we can support that or make it a better experience for them,” Alex said. From collaboration to asset hosting, every paid feature has a lightweight, free version for the rest of the community. “We’ve kept this balance of working on things the community would love but, at the same time, creating just enough Pro features to continue growing the company,” he said. CodePen’s browser-based editor gives adjustable areas for your code and preview. Coding is very comfortable, given the editor’s syntax highlighting and Emmet integration. We also seriously appreciate the Tidy button — a one-click way to clean up your indentations and formatting. CodePen gives frontend developers a stress-free space to write and preview code. When you’re ready to share your Pen, the editor provides a copy-and-paste embed code, links to share on social media or through text message, along with an export to a zip file. Other CodePen users can discover your work and elect to fork the code or heart it to show appreciation. Members can follow each other and curate Pens into collections to find useful Pens more easily. The first tools the Co-Founders added to CodePen interface streamlined how developers could share their Pens. Naturally, the Co-Founders added a stripped-down blogging interface, which is included with every CodePen account. The blog editor supports Markdown, syntax highlighting, and custom CSS for individual posts. CodePen provides several different viewing modes for the various ways to share your Pens: Collab Mode lets multiple people type and edit code at the same time, while Professor Mode enables learners to watch their trainer work as they type. Alex’s favorite view, Presentation Mode is geared toward conference demonstrations and showing Pens on a projector. Coding demonstrations are easier for attendees to interact with through CodePen’s Presentation Mode. Users can share Pens with an abbreviated link and resize the editor and preview appearance. Smartly, CodePen removed all but the essential features so the platform loads quickly — even using the standard terrible wifi at conferences. CodePen continues to add and improve features, largely driven from user feedback. Even though CodePen members drive a lot of platform improvements, Alex said the team prefers to keep big changes close to the vest until they’re ready to go live. One such update coming later this year is the reason Alex joined CodePen — except he thought the team would be able to offer it in the first year of the platform. Four years later, CodePen is narrowing in on the ability to “create MiniPens inside of Pens, to say it in a really obscure way,” Alex said. The new feature will allow developers to dive deeper into Pens without the complexity of version control or local environments. On the other end of the update spectrum, Alex was happy to give us the “least exciting scoop you’ve ever heard.” He recently shifted his development efforts to rebuilding CodePen’s payment process and integrations with Stripe and Braintree. Alex, Tim, and Chris slowly grew CodePen’s team to eight employees over the past five years, with everyone working remotely. “We don’t even have two people in the same state, much less the same city,” Alex said. Over the past few months, the team has formalized communications into project management sprints. Informal discussions still happen on Slack, but they track issues and time in GitLab. As a remote team, CodePen employees were sure to snap a picture during the only time they’ve met in person. The CodePen team records a podcast that gives a fascinating and transparent look at running a small web software business.